Tyson's 25-oz. plastic bag packages of frozen “Fully Cooked Crispy Chicken Strips Chicken Breast Strip Fritters with Rib Meat” were among three products involved in a recall for potential contamination with metal. Two consumer reports prompted the USDA action. Tyson Foods Inc. is recalling about 69,093 pounds of frozen, ready-to-eat chicken strip products that may be contaminated with extraneous materials, specifically pieces of metal. • 25-oz. plastic bag packages of frozen “Tyson FULLY COOKED BUFFALO STYLE CHICKEN STRIPS CHICKEN BREAST STRIP FRITTERS WITH RIB MEAT AND BUFFALO STYLE SAUCE” with “BEST IF USED BY NOV 30 2019,” case codes 3348CNQ0317 and 3348CNQ0318, and individual bag timestamps from 17:00 through 18:59 hours (inclusive). • 25-oz. 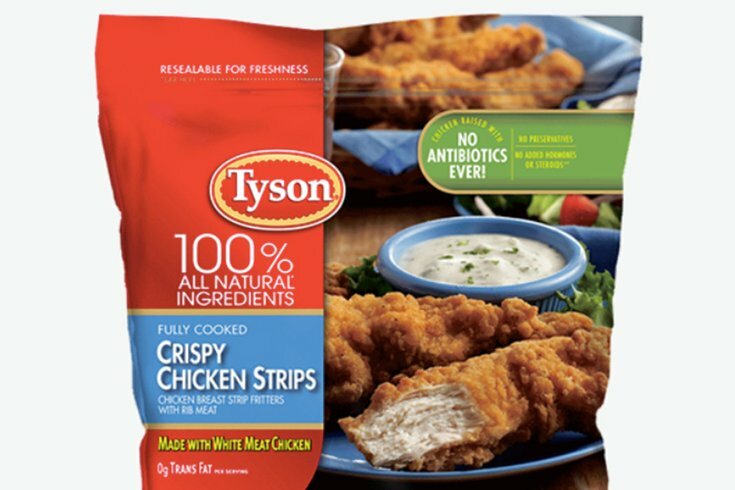 plastic bag packages of frozen “Tyson FULLY COOKED CRISPY CHICKEN STRIPS CHICKEN BREAST STRIP FRITTERS WITH RIB MEAT” with “BEST IF USED BY NOV 30 2019,” case codes 3348CNQ0419, 3348CNQ0420, 3348CNQ0421, and 3348CNQ0422, and individual bag timestamps from 19:00 through 22:59 hours (inclusive). The products subject to recall bear establishment number “P-7221” on the back of the product package. For product clarification, the last two digits of the product case codes correspond to the hour produced and will match the first two numbers of the time stamp (as depicted on the label). These items were shipped to retail locations nationwide. In January, Tyson recalled about 36,420 pounds of chicken nugget products for potential contamination with rubber.